This entry was posted in internet, web2.0, 工作雜記. Bookmark the permalink. –Content can be cached, so it will be accessible even if the PC is off line. •Can share publicly like Youtube, flickr, blogger, etc., with a powerful full-text search engine. •Can share directly with friends through PC 2 PC connection without the limitation of file size. •Can manage the sharing directories easily regarding what to share and who to share! •Can set up a community for friends/relatives on one’s own PC. •A browser with information management function. •A decentralized portal which is a federation of collaborative regional portals and personal portals, while the center is a community center and search engine for the nuweb space. 原來Web 3.0這個口號, 是台灣中正大學吳昇老師企圖引領的風潮. Made in Taiwan, not bad! 仔細拜讀簡報, 對於Web 3.0所得到的概念是: "Infrastruture Change (marriage of WWW & P2P) to lead User Autonomy Improvement over the Internet world". 從某個角度看, 不得不佩服吳老師"捨我其誰"的偉大情操. 不論是人文或科技, 這個世界絕對需要"學術界"為前導, 來進行先驅研究與開發. 學術的領域通常是追求理想的, 就像Complete User Autonomy這樣的目標. 在這個目標底下, 吳老師想要克服的是, 因為WWW的架構所衍生的大型網站操控使用者的現象. 雖然有大型網站的存在, 但其中很難不注意到, 其實Internet User也有很大的權利, 也就是說如果以商業為目的的網站(或企業), 如果無法取得使用者的青睞, 終有被淘汰的一天. 這很類似民主政治運作: 如果政黨無法受到人民的信任, 選票可以決定誰來主政(雖然選舉結束, 選民只剩下監督的份). 微軟已經承認, 如果不往Web-based application的方向發展, 遲早有王朝瓦解的一天. 這就是Google所帶來的威脅, 背後自然也是消費者的選擇權在主導. 然而以商業為目的的網站, 卻也有其存在的必要. 任何研究與發展, 皆需要人力與財力的資源投入. 而不可諱言的, 人們也需要有經濟的來源, 來支持其食衣住行的需求. 尋求營收來支應其營運與未來的發展, 也自有其必要性. 學術的領域, 或者是學校的行政資金, 或者是其他來源的贊助, 總之也必須有金錢的挹注, 才得以成長與茁壯. 有些太大的研究計畫, 如太空科學, 已非私部門可以支持, 最後就得由公部門(資金來源是人民的稅赋)來執行. 商業不必然那麼窮凶惡極(雖然商業有時造成財富過度集中). 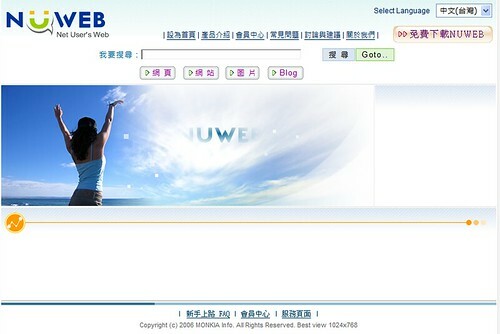 有趣的是, Web 3.0最終也必須有其商業模式才能實作(希望不是一種迷思). 若吳老師的理想果真實現, 屆時對於商業模式的影響又是什麼? 恐怕更耐人尋味.